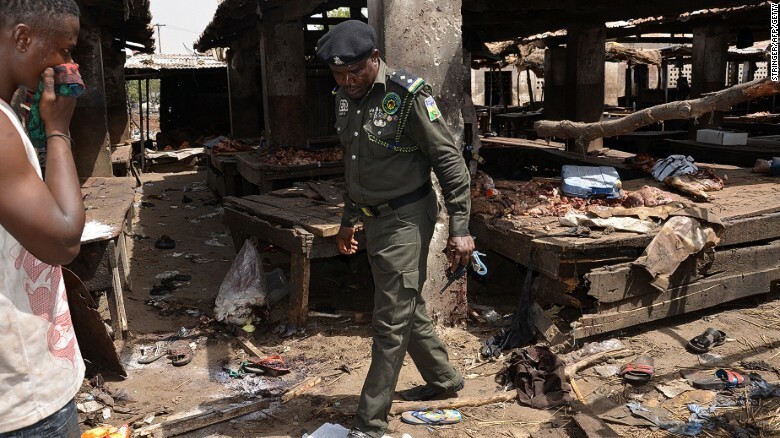 A Nigerian policeman inspects the site of a suicide attack at a busy cattle market in the northeastern Nigerian city of Maiduguri on June 2, 2015. At least 13 people were killed and 24 others injured in a suicide attack on an abattoir in the northeastern Nigerian city of Maiduguri, hours after Boko Haram fighters pounded the city with volleys of rocket-propelled grenades in an attack repelled by troops, an aid official, vigilantes and residents said. A suicide bomber disguised as a customer detonated his explosive vest in a crowd of butchers and shoppers ‎at the abattoir in the Kashuwar Sanu cattle market in the city. "We have evacuated the dead and the injured victims to various hospitals in the city," said Umar Sadiq, head of the Nigeria Red Cross in the city. The attack happened around 1 p.m., when business was at its peak, said vigilante Hamisu Kaka. "The suicide bomber deliberately targeted the most crowded part of the cattle market, the abattoir, and detonated his explosives there, which was from all indication aimed at maximizing casualty," Kaka said. "It was a gory sight. We took time trying to sort out human bodies from raw beef that were scattered all over the place from the explosion," said Ibrahim Shehuri, another vigilante. Nobody has claimed responsibility for the attack, but Boko Haram Islamists have been blamed for a series of similar attacks, including a Saturday suicide attack on a mosque in the city. That attack left 26 people dead and 28 injured. Tuesday's attack came hours after the Islamists bombarded the Ajillari Cross neighborhood of the city with rocket-propelled grenades, residents said. The Islamists fired dozens of RPGs on Ajillari from Moronti village, 3 kilometers away, where their advance on the city was disrupted by a ditch and sand embankment ‎the military dug to prevent Boko Haram infiltration from vulnerable points. Troops responded while a fighter jet bombarded the attackers' positions, forcing them to withdraw, residents said. "They started firing RPGs‎ at 12:45 a.m. from Moronti, which continued 'til 2 a.m., when they were forced to retreat by military fire and aerial bombardment," Ajillari resident Buni Lawan said. No one was hurt in the attack as the missiles fell in the open, according to residents. "We all moved out of our homes to avoid being hit and because it was dark we could see the trajectory of the RPGs, which were red with heat,‎ which enabled us to dodge them," Lawan said in an account supported by other residents. The attack came a day after a similar RPG attack on the nearby Dala neighborhood killed 13 people and injured seven others, according to a vigilante leader and residents.